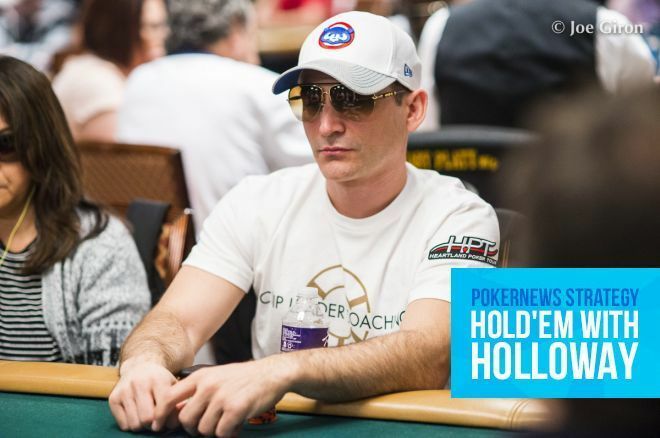 Hold’em w/ Holloway, Vol. 75: @ChadAHolloway talks with @NickJivkov about exploiting capped ranges. At the end of the July, World Series of Poker bracelet winner Nick Jivkov was going deep in the Heartland Poker Tour Kansas City Main Event. Jivkov, who is involved with Chip Leader Coaching, ultimately finished in third place for $40,562. I had the opportunity to speak with Jivkov after his run and asked him if any big hands stuck out. "One hand was a perfect example how you have to analyze the play, opponent's stack size, and think of creative ways to win the pot when you know the opponent's range is capped," he said before describing the hand. It took place with eight players left in the 600/1,200/200 level. Jivkov was sitting with 125,000 in the big blind and action folded around to him. He looked down at and he made it 2,600 to go. Jivkov: "This is another spot where many inexperienced players would figure the jig is up." "Usually I will fold this hand on the button if the small blind or big blind are competent opponents, but I perceived both blinds as weak opponents and I know if stealing the button does not work, they will make many mistakes postflop, so I decide to raise," Jivkov explained. The player in the big blind, who was sitting with 37,400, called the extra 1,400 and it was heads-up action to the flop. The player in the big blind checked and Jivkov continued for 2,500. His opponent called. "This flop connects much better with my range than the villain's defend range," said Jivkov. "He doesn't have many strong kings here. When he check-calls the flop, his range consists of some weak kings, some sixes, all flush draws, backdoor combo draws like , , etc." After the dealer burned and turned the , the big blind check-called another bet, this time 7,200. "The turn is a great card for me to continue to represent a strong hand as I pick up a gutshot draw," Jivkov explained. "There is 12,400 in the pot and villain has 32,300, just about 2.6-to-1 SPR [stack-to-pot ratio]." "Many players make the mistake of giving up here and checking back because they have a gutter draw and fear that the villain may be trapping them and check-shoved after they bet. While this is a possibility, it's definitely going to happen a very small percentage of the time and the right way to play is based on what will happen the majority of the time, which in this case is the villain has a very wide big blind defend range which is capped. Unless he was trapping you with AA, KK, or AK preflop, which a good opponent may do. However, this particular opponent was weak and does not have these hands in his range." Jivkov continued: "I saw this as a perfect spot to keep applying pressure and bet a sizing where I leverage his stack and force him to fold his medium strength hands. I bet 60 percent pot (7,200), which was a quarter of his stack, and he just called. Versus a competent opponent I would be very cautious of this call, but versus weak opponents, this basically assured me that his range is very weak and consisted of a lot of flush/combo draws and I could win the pot by firing a third all-in on the river." With 26,800 in the pot, the completed the board on the river and the big blind led out for 10,000. Jivkov raised to 45,000 and that did the trick as his opponent folded. "Here is where things got very strange," said Jivkov. The river misses all the draws, which is good for me to continue with my plan, but at the same time, it is the perfect card for him to hero call me if he does have some weak king in his range. The pot is giving him a 1-to-1 SPR and he can perceive me as having lots of missed draws in my range and needing to bluff in order to win." "That put me in a bit of a predicament and this is where live reads and experience play a huge role. The villain takes a very strange line and bets 10K of his 25K into a 27K pot. This is another spot where many inexperienced players would figure the jig is up, the villain clearly has something and they don't have enough fold equity to get a fold and give up on a 37K pot." "I, however, took a minute to analyze the situation and realized that weak players usually make strange plays like this when they miss a draw or have a very weak hand. They don't know what to do, they are scared to commit their whole stack on a bluff, so they make a small blocker-type of a bet hoping their opponent was on a bluff and folds." Knowing he couldn't win by just calling, Jivkov moved all in to chase his opponent off the hand.